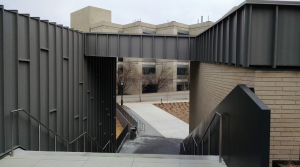 The 238T metal roof panels on this project turn down walls and back under soffits to create continuous lines from one side of the building to the other. Roofing Contractor: Harness Roofing Inc., Springdale, Ark. General Contractor: Nabholz Corp., Rogers, Ark. The 238T metal roof panels on this project turn down walls and back under soffits to create continuous lines from one side of the building to the other. Layout was critical. Horizontal ribs were added to staggered wall panel laps to add interest. Only metal panels could achieve the desired aesthetic. This project included a number of challenges. For example, there was no room to store materials on the job site; the panel machine had to be craned up to the roof where panels were run and stacked on the roof; and wall panels were run at Harness Roofing’s shop and hauled to the job site as needed.